What is the Productive Macs bundle about? Looking at the current offer, I think it can be described best as a bundle for boosting your “data management”. Most of its apps have to do with organizing and giving you quick access to your files. Thus, if you are dealing with a lot of different files that don’t fit into a PDF management system like Sente or Papers, I definitely suggest you check out this bundle. Beside the “data management” focus, there is a second reason why you would want to buy this bundle, and this reason is called TextExpander. Bryan, who has written a guest post about TextExpaner here on academiPad, has convinced me to get it for myself, and it has soon become one of my favorite little productivity helpers. Download the trial version and try it for yourself – you won’t want to go back! Whats the downside of this bundle? Most of the other apps aren’t really that interesting. Really. Your milage might vary, but I personally wouldn’t use most of the apps in this bundle. However, TextExpander, iDocuments, and Pathfinder are each alone more expensive than the bundle price. If you think that one of these apps is useful for you: go for it. And if you are interested in two of them (in my case: TextExpander and iDocuments) or if you like one of the other apps, this bundle is a no-brainer. This Productive Macs bundle is a great deal if you don’t already have TextExpander installed and/or you want to improve your data management workflow. The bundle closes on December 1st. Bryan then gives some examples of snippets he uses to save time (e.g., inserting date, time). Now that I use TextExpander myself, I can contribute my own examples: I use snippets to fill in all kinds of forms. For example, I use the snippet “;qemail” to spell out my lengthy Queen’s University email address. Another use for me is to quickly insert code while working on academiPad. Writing standard emails is when TextExpander really shines. For example, I use some standard emails to recruit participants for my studies. Before using TextExpander, I had to open MacJournal where I saved this standard text, copy it to my clipboard, and then paste the text into the email. Not any longer! Now, all I have to do is to type “;HNRrecruit” – bang! So here is where I add something to Bryan’s great post: He presented TextExpander as a wonderful tool for saving time, and it is! But it is more than just for saving time: TextExpander keeps me calm and relaxed, because I don’t have to jump around different apps and search for the bit of text I need. Really, give it a try, and you will soon find that you will want this bundle just for TextExpander. iDocument and Pathfinder are the other reason why I think the current Productive Macs bundle is a good deal for academics. At least those of you who sit on a lot of files. You probably won’t need both apps, as both aim to substitute the aging Mac Finder. iDocument is an iTunes-like document management system that helps you keeping all your working files together. First, you have to import your files from their current folder locations into iDocument’s database. You can organize them either in the classical structured way (your Finder structure will be imported), and/or you can use tags to organize your files. Once your files are in the database, you can use all the advanced database features that you know from iTunes, iPhoto, Papers or Sente: Flag, label and rate files, add tags, sort them through smart collections, and so on. And just because your files are in the iDocuments database does not mean that they are gone: The app is fully integrated with the Mac OS Spotlight search. Best: iDocuments has you covered even when you like to have your files in the cloud. It integrates with Dropbox, and there is a free iPhone app that lets you manage your documents on the go. The only problem: the app is currently under maintenance and not available to try it out – great timing, guys! iDocuments is similar to Leap ($26, Mac App Sore link), my favorite Finder replacement app. I would say that Leap is a little more powerful, but iDocuments is easier to learn and it recognizes the growing importance of cloud computing. If you prefer to keep all your files in the original folder system, Path Finder is the better app for you. It basically is what Apple’s Finder should be: Its features include dual plane file browsing, file drop stack for moving files easier, tabs, bookmarks and much more. Path Finder also added tagging support recently, which I am very happy to see. Many of the other apps are about accessing your files and information, but I personally don’t think that they, by themselves, are compelling reasons to buy this bundle. Trickster and Destop Shelves let you access your most often and recently used files faster. I tried out Trickster and Desktop Shelves and don’t really see need for them in my own workflow. Concealer makes accessing sensitive information more secure. That is good, but it won’t encrypt whole files or folders. I used DiskAid once to see whether I could get audio recordings from my iPhone to my Mac, but in the end I was able to solve that problem through iTunes just fine. Last, I personally also don’t see much use in Optimal Layout or TaskPaper. I don’t care much about how my windows look like, and I much prefer visually appealing (and free) task managers such as Wunderlist. So bottom line: In my opinion, whether or not you want to spend thirty bucks on this Productive Macs bundle really comes down to whether or not you already have TextExpander and/or a need for improving your data management workflow. I am pretty sure that TextExpander is an indispensable tool for everyone in academia, so really make sure to give this one a try. If you already have TextExpander and iDocuments is the only app that really appeals to you in this bundle, then I would suggest you compare it to ironicsoftware’s Leap ($26, Mac App Store link). You can download a free demo version here. Was this review helpful? Do you think this is a good bundle for students and academics? If so, then please let your friends know of this Productive Macs bundle review by retweeting the tweet below, or by sharing this post in your social network. 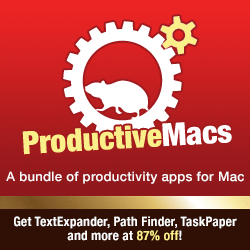 You can get the Productive Macs bundle here. The bundle will close on December 1st.